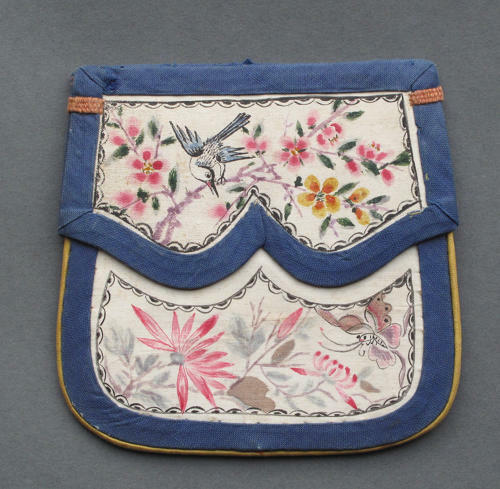 An unusual Chinese silk purse with painted decoration. The purse is painted on a cream silk background on one side with a bird and a butterfly amidst flowering plants, and on the other side with two crabs among rushes and flowering lotus. The purse dates from c1900 and is 11.5 cm / 4.5" tall. The word for crab is a homonym in Chinese for those who have passed the first exam towards the official rank, and the combination of two crabs among rushes forms a pun in Chinese (er jia chuan lu) again referring to success in the court civil exam. The purse is in overall good condition. There is some wear and fraying to the blue silk band at the mouth of the purse, and some faint marking to the cream-coloured background silk of the purse. Please examine our photographs.